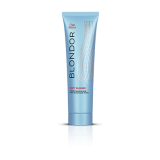 Whether it is for subtle self-expression or dramatic statement looks, Blondor offers complete collections of products that will enable any type of service. Discover the world of Blondor and its product collections that enable full head, partial, as well as foil based and freehand application techniques. Dust free bleaching powder Suitable for all highlighting techniques ..
Lightening Cream For gentle blonde results Suitable for all highlighting techniques..
For a plus on coolness. not a standard lightener, but a unique combination of lightening &am.. Conditions lightened hair and gives shine First ever blonde shine conditioner from a lighteni..